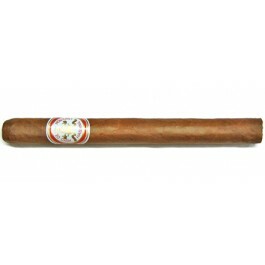 The Hoyo de Monterrey Double Coronas is a subtle Cuban cigar, a light-medium Prominente, 7.6” (194mm) long, of 49 ring gauge, and comes in a 25 cigars box. For some, they say this is the best cigar in the world. This Double Corona has already confirmed its rank in the marketplace: it's a great smoke. The only complain that could be made about this cigar come from very seasoned aficionados who would say it might not be strong enough. As all vitolas from Hoyo de Monterrey this Doble Coronas (Double Coronas) is extremely well constructed. It has a smooth oily wrapper, a good draw and strong aromas. Every modern Habano has somehow been influenced by this amazing cigar, but it is in a league of its own. It is softer in touch and creamier than the Partagas Lusitanias and the Double Coronas from Punch, it appears also bigger when in hand. Truly a man’s smoke. This is big, bold, hearty and beefy but in a sophisticated way. Never harsh or aggressive. • A simple yet very complex smoke. Subtle yet profound. • Everything one could hope for may be found in this cigar. A sensual delight for those times when you have 2+ hours to spare. Relax and savor the aromas and flavor. A beautiful sheen on the smooth mahogany wrapper. A beautiful bouquet on the foot. Both the burn and draw are perfect. The light-up was all roasted wood and hickory. A tiny hint of sweetness to linger on your lips and palate. The second third gives way to coffee, tobacco, vanilla, cream and some toast. Stronger flavors all well-orchestrated in perfect harmony, cocoa, marzipan, honey, leather, espresso, barnyard, cinnamon, pepper, cedar and caramel. To summarize, a perfect cigar!! Hats off to Hoyo! Tout le savoir faire Cubain se retrouve dans ce très grand cigare plein de finesse et de subtilité. Ce n'est pas un cigare pour le amateur de puissance qui lui préférerons de loin un Lusitania mais ravira les palais délicats. Notes florales et miellées tout au long de la dégustation avec un final légèrement crémeux.